There was a point in time in the George Senate race for the retiring Republican Saxby Chambliss, that Democrat challenger Michelle Nunn had a chance of pulling off the upset and shift what has been a red state to a blue Senate seat. How much of that though was because of a liberal media pushing Michelle Nunn as the daughter of former Georgia Senator Sam Nun? Georgia, do you really want to be the state that continues to empower Harry Reid and President Barack Obama? Sorry, but Michelle is not Sam Nunn. 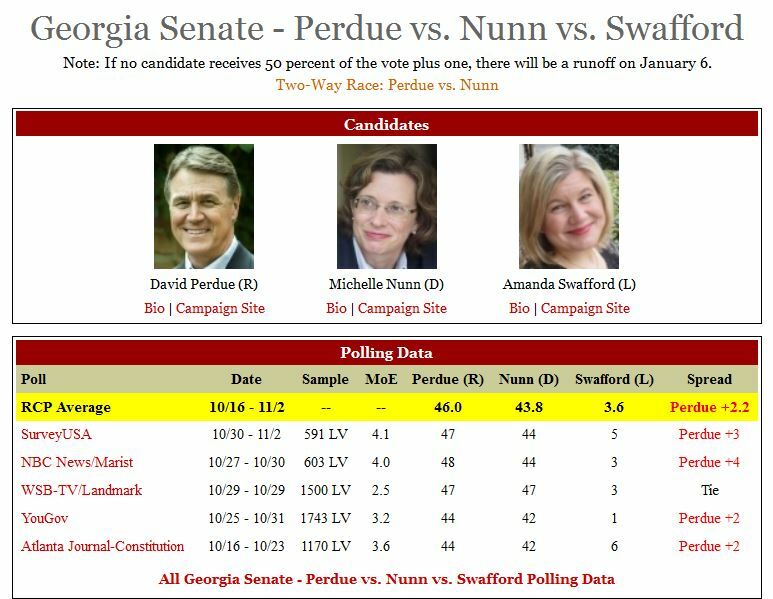 However, the early favorably polling for Michelle Nunn seems to be subsiding as Republican David Perdue has taken the lead in the polls. According to the most recent RCP polls, Perdue is up by 2.2%. Just remember Georgia, a vote for Michelle Nunn, is a vote for Democrat Senate Majority Leader and President Barack Obama. For a brief time in mid-October, some Democrats believed Michelle Nunn, the party’s Senate candidate in Georgia, could be the firewall that prevents a Republican takeover of the Senate. If Nunn could win the seat opened by retiring GOP Sen. Saxby Chambliss, then Republicans would need to pick up seven, not six, seats to take control. In half-a-dozen polls taken over a two-week period in the middle of October, Nunn led Republican opponent David Perdue in five, while the candidates tied in one. Democratic optimism surged. “National Democrats have just decided to pour $1 million into this race in Georgia, a sign of how important a victory here would be to their effort to beat the odds and hold on to control of the Senate,” the Wall Street Journal reported Oct. 17. More pro-Nunn money came after that, with a barrage of ads focusing mostly on accusations the businessman Perdue outsourced thousands of Georgia jobs. Now, things have changed. Perdue has recovered from the attacks — he indisputably helped create thousands of jobs in his career — and in the last six polls, taken since Oct. 16, Perdue has led in five, while one was a tie. In the RealClearPolitics average of polls, Perdue is up by 2.2 percentage points. In the newest poll, a NBC News-Marist survey released Sunday, Perdue leads by four points, 48 percent to 44 percent.